In recent months, Department of Justice officials have met with Ken Caldeira, an atmospheric scientist in the Department of Global Ecology at the Carnegie Institution for Science, as well as Judith Curry, a professor emeritus at the Georgia Institute of Technology's School of Earth and Atmospheric Sciences who has broken with many of her colleagues in the field by questioning the extent of humanity's role in climate change. 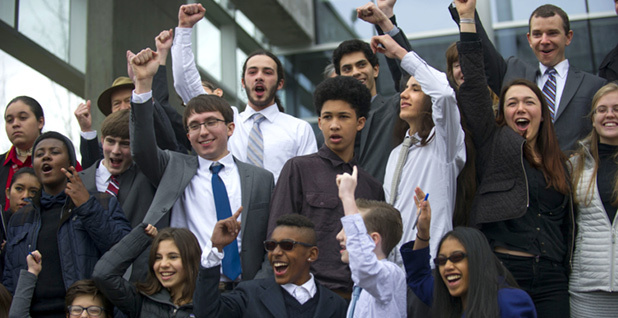 A children's climate change case, known as Juliana v. United States, was filed in 2015 by 21 young plaintiffs who claimed their constitutional rights had been violated by government inaction on climate change and by policies that could exacerbate it, like oil and gas drilling in public areas. Earlier this year, just days before Trump took office, the Obama administration Justice Department argued that there is no widespread belief among scientists that the world's climate becomes dangerous after passing the 350-parts-per-million mark for atmospheric carbon dioxide, a key metric in the case. Scientists have noted that the current level of CO2, which is about 410 ppm, has not been seen in at least 800,000 years. Ultimately, the case could have even broader implications than an upcoming "red team" climate debate exercise planned by U.S. EPA Administrator Scott Pruitt because it could yield future government action on climate change, according to Gregory. He said his plaintiffs have extensive evidence that glacial melt, coral reef destruction and rising temperatures pose a grave threat to future generations. "What we're going to have is the youth of America and their climate scientists," he said. "The Trump administration can bring on any scientist it wants, and we can have that debate based on evidence in a courtroom, so it's better than the Scopes trial, because in the Scopes trial, it wasn't limited to scientific evidence; they talked about the Bible and waved that around." Trump has dismissed climate change as a hoax, and chose a number of Cabinet secretaries who question basic climate science. If the case proceeds to trial, however, government lawyers would be forced to argue that climate change does not pose an immediate threat, something mainstream climate science long ago determined is endangering humanity. There has been a significant focus from both critics and supporters of the Trump administration on whether Pruitt will challenge the endangerment finding, the legal undergirding of EPA's climate rules. A few months ago, Justice Department lawyers went out to lunch with Caldeira, he told E&E News. They asked if he would take the lead on assembling government witnesses for the case. He said the lawyers are career officials, holdovers from the Obama administration. The lawyers told Caldeira they thought the case was weak, but that proving climate change poses an irreversible harm to humanity would benefit the plaintiffs, he said. Their position was that energy policy is something for the legislative branch to grapple with, not the executive branch, he said. The Justice Department likely reached out to Caldeira because he has been critical of the case, because he does not think the courts are the place to resolve climate policy. He said he would have worked with the Obama Justice Department because he feels a duty as a scientist to ensure that the best available research is used. But he declined the Justice Department's request for help, he said, because he is concerned that his work would be distorted for political means by the Trump administration. "Since so much science is publicly funded, scientists have some responsibility to help have good science considered by the judicial process," he said. "Things are terribly clouded because we have such an awful president and such an awful administration, even efforts to try to get good science into the process could result in negative consequences." Caldeira is also concerned that if reputable scientists don't participate in the case, the Justice Department could use contrarian researchers to weaken established science. "You could easily imagine the Trump administration arranging things to not having the best available science presented, but having a perverted view of science presented," he said. "So I think there is a conflict if all good scientists refuse to participate because they don't want to collude with the Trump administration, then that leaves only the hacks, and it's likely that the government's case will be buttressed by hack science." A Justice Department spokesman declined comment. However, it appears the department is still talking to researchers. Curry said last week that she was still interested in helping the government with the case, but only if it took place in a nonpartisan manner. Curry has broken from many in mainstream climate science by casting doubt on the belief that humans are the primary driver of climate change. She has also published a significant amount of peer-reviewed research in major scientific journals, including on the Arctic and the causes of the climate feedback that have shaped the region. "I'm prepared to give my best expert advice in a nonpartisan way; they may not like some of it," she said. "You just have to give it your best, deepest, most honest shot of explaining what's what, what we don't know." The plaintiffs in the case have already submitted an expert review by scientists, economists and other experts in the field that clearly shows the threat climate change poses to future generations, said Gregory, the co-counsel representing the plaintiffs. The government has not submitted a report that would challenge established climate science, and lawyers have essentially argued that producing such a report would be too burdensome, he said. "Our position all along has been to put the science on trial, and we want for them to bring in recognized scientists and let those individuals submit reports and testify before the courts; that's exactly what we think should happen," he said. "Obviously what's occurring now in our climate should not be decided by politicians, but should be dictated by the best available science."